Coming right after coconut oil, palm oil is one of the best known tropical oils in the world. It has precious nourishing ingredients. It may be successfully used in medicine, cosmetology and even in the kitchen. It is extracted from the seeds of African oil palm (Elaeis Guineensis). The diversity of elements and good fatty acids hidden inside the oil makes it welcome in every kitchen and bathroom. Why? 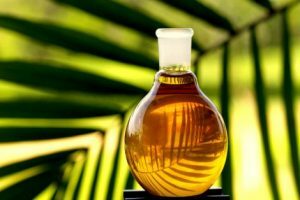 Unrefined palm oil is orange because it contains lots of beta caroten which improves skin condition and hinders wrinkles. Orange oil conains a great dealf of coenzyme Q10 i.e. ubiquinone. It also has strong rejuvenating properties and stabilizes cell membrane of the skin. As a result, hair and skin won’t lose the absorbed nutritional ingredients. Coenzyme Q10 makes cells more resilient therefore we owe strong hair and firm skin of young density to the coenzyme. Vitamins A and E, included in the oil, are also called “vitamins of youth”. They are responsible for the condition of hair, nails and skin. They take care of proper hydration in the cells. Palm oil smooths and nourishes very dry skin, makes hair bouncy and protects it from water loss. It regenerates mature skin well, strengthens its resilience. It elasticates hair and conditions hair ends. Due to its orange colour, it is mainly recommended for red, auburn and brown hair. It will emphasize their colour and strengthen the reflections. Women who have light eyebrows can use it to delicately darken the brows. It’s enough to rub them with the oil once a day, preferably during evening beauty routine. Oil palm moisturizes the scalp very well and helps to fight dry dandruff. It strengthes hair bulbs and reduces hair loss. It also protects hair from the damaging effects of external factors, including UV radiation. It’s best to store palm oil in the fridge, in a dark container to protect it from the light.